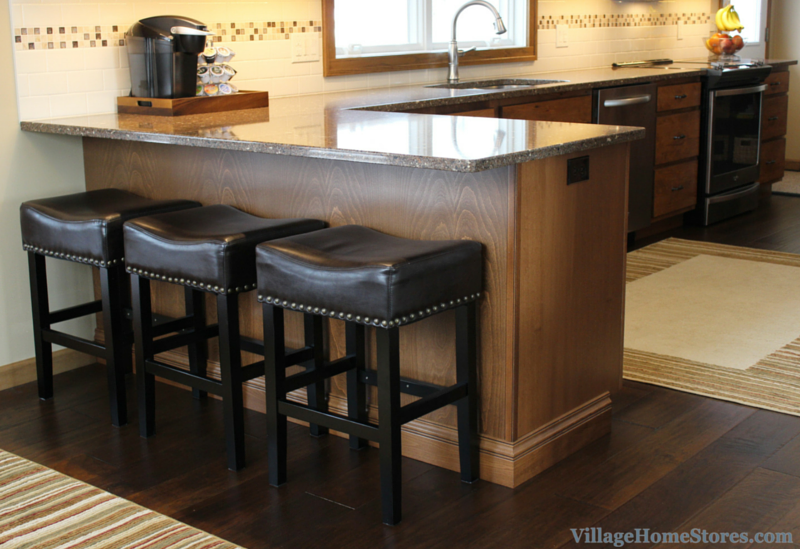 This kitchen remodel was done by a homeowner in Geneseo, IL with design and materials coming from Village Home Stores. The original kitchen included a wall that divided the kitchen from the dining area. With the wall now removed, the new space is full of light and space. Now in place of the wall is a peninsula of cabinetry and countertop that has quickly become a favorite place for visiting grandchildren. 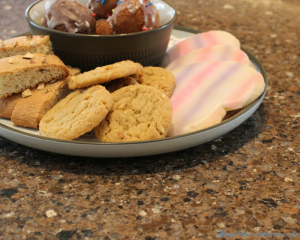 One of the sure signs that this peninsula is the place to be in this new kitchen is a plate of treats awaiting guests. What grandchild (or visiting Village Home Stores employee) can resist pulling up a stool to chat or help out in this great new space. 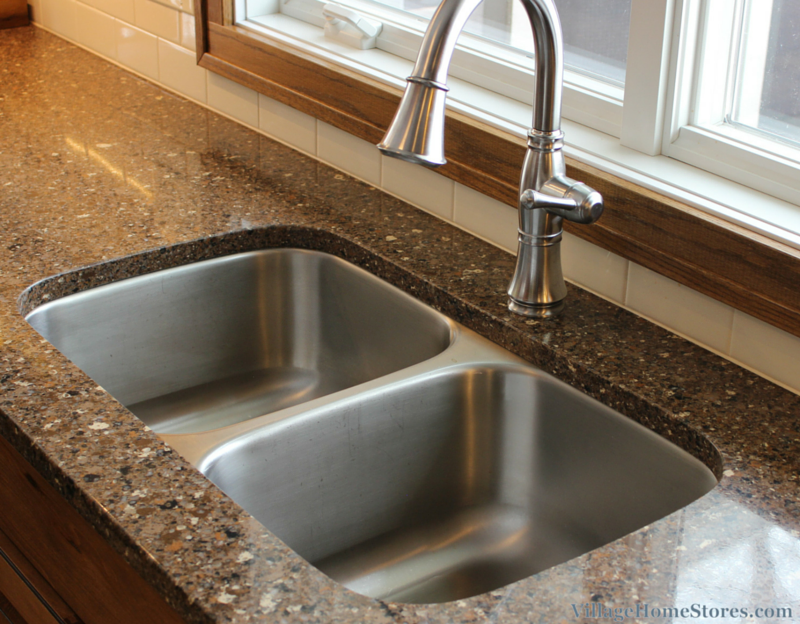 The countertops selected for this remodel are by Silestone Quartz in “Sierra Madre”. Added piece of mind is that Silestone includes Bacteriostatic Protection which means silver ions are included in the quartz to prevent the propagation of bacteria. A perfect added value to this selection since this new peninsula area is ideal for for preparation and serving. Can’t you just picture a “gaggle” or grandchildren all gathered at this top making Christmas cookies? An outlet has been installed at the very end of the peninsula for small appliances or even a laptop or tablet can be plugged in if used as a desk. With all of those guests and a bright new space to enjoy, these homeowners better stock up on some snacks! 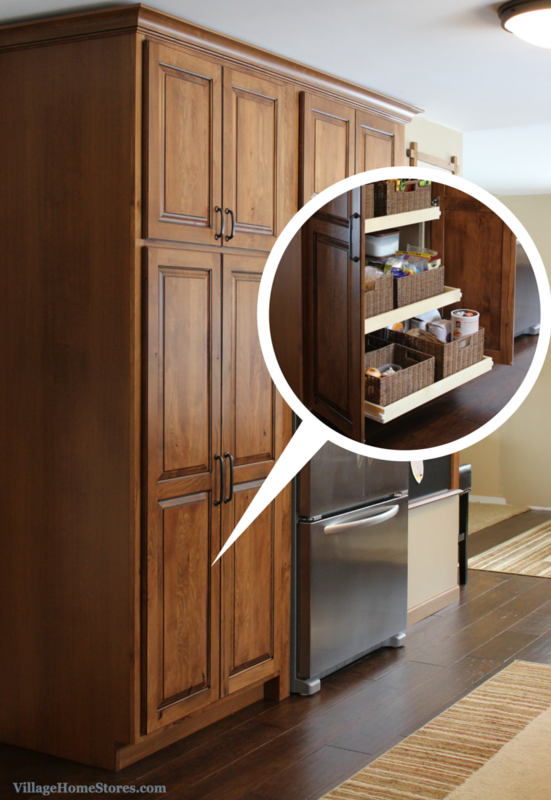 There is plenty of places to store them within the pantry zone of the new kitchen design. The wall that is home to the refrigerator is also where you will find a wide pantry cabinet. Three adjustable-height sliding trays of storage plus a stationary shelf above that allow full access to the lower section. The trays are a very versatile way to use the space and extend out to allow the user to see everything within. Above is a 24″ deep space for appliances or bulk items. Click play to watch this cabinet and all of the trays in animated form. 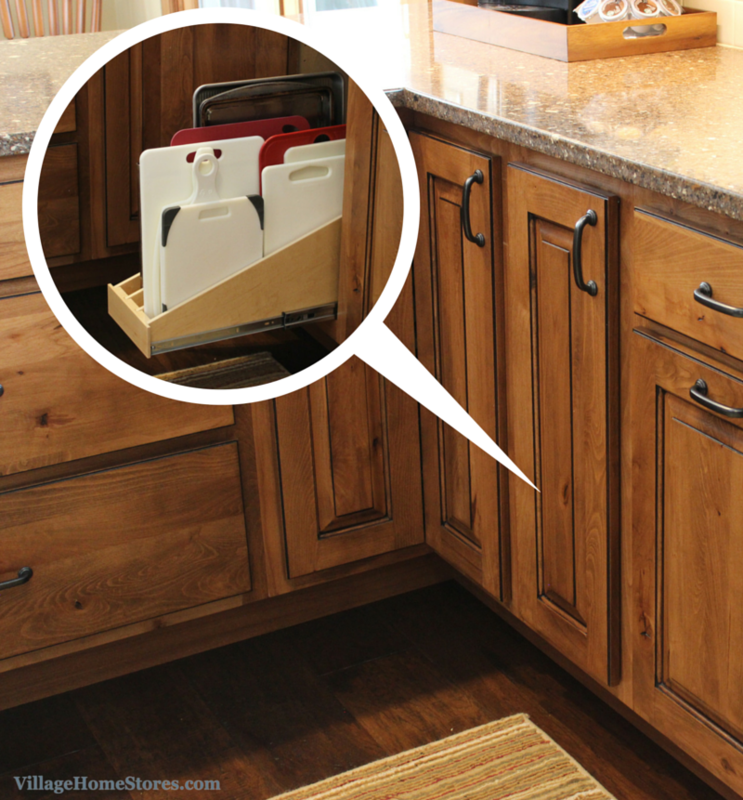 We love the addition of baskets to the slideout trays! 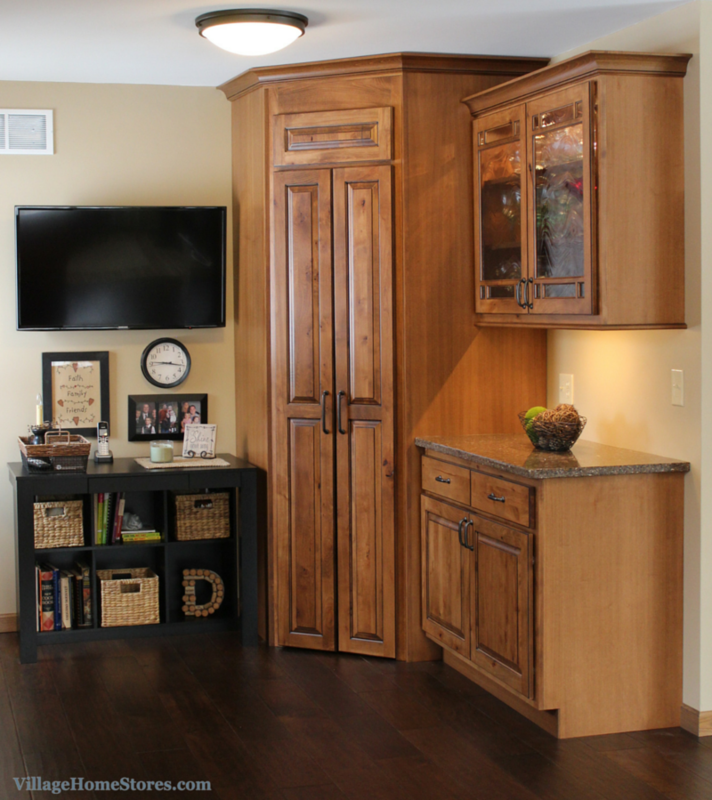 This kitchen was so full of great storage we had to include it on a storage-themed episode of our local TV show. 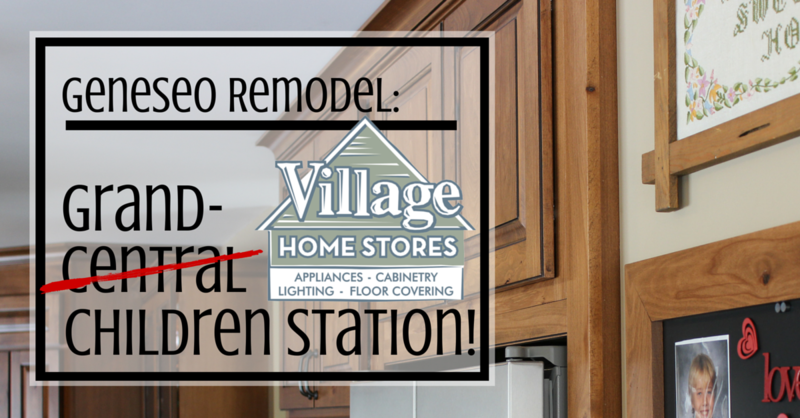 Watch that full episode here to see the full details tour of this great remodel! 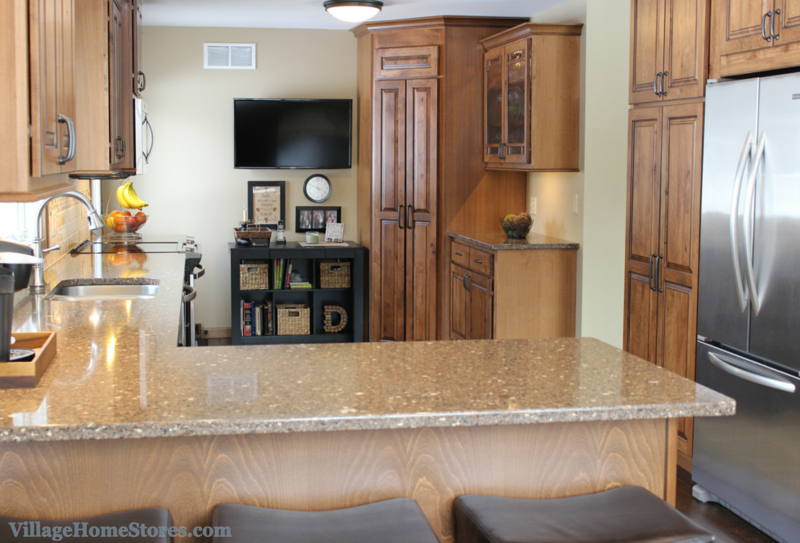 Two incredible kitchen remodels both featuring storage solutions perfect for each home. It is amazing how something as basic as adding sliding shelves can help you enjoy and use your kitchen space more. 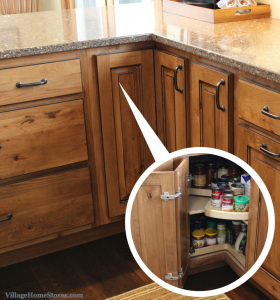 Don’t miss out on the oportunity to fill your cabinets with the best storage potential possible. Believe it or not this tall pantry cabinet is not the only great pantry storage section in the new kitchen. Just down the wall is a walk-through corner pantry front with a glass-door display cabinet to the right. Ordered to match the “Seneca Briarwood” Rustic Beech cabinetry from our Koch Classic line, this front and two panels were used to assemble the corner area. The homeowner even installed a motion-sensitive light on the interior so that when the pantry doors are opened, the lights turn on. After just a few minutes they automatically turn off. Walk-through pantry fronts are fantastic because you can truly customize your shelving behind them any way you would like. Click play to see the pantry! While we didn’t do any of the install work for this kitchen, we knew the project was in great hands by a VERY skilled carpenter (who has installed countless projects for our customers). 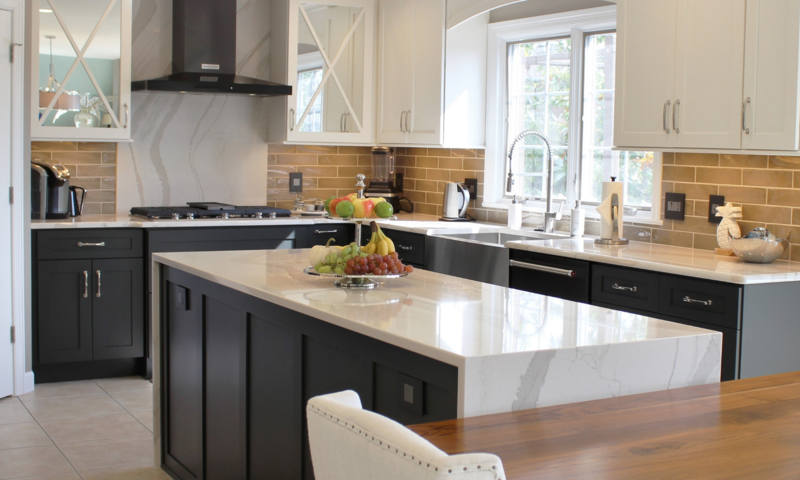 Wait until you see some of the extra work that he put into making this kitchen completely customized for them. This display cabinet with mullioned glass doors got an extra custom detail added to the interior shelves. The center section of the finished shelves was routed out to accommodate tempered glass inserts. 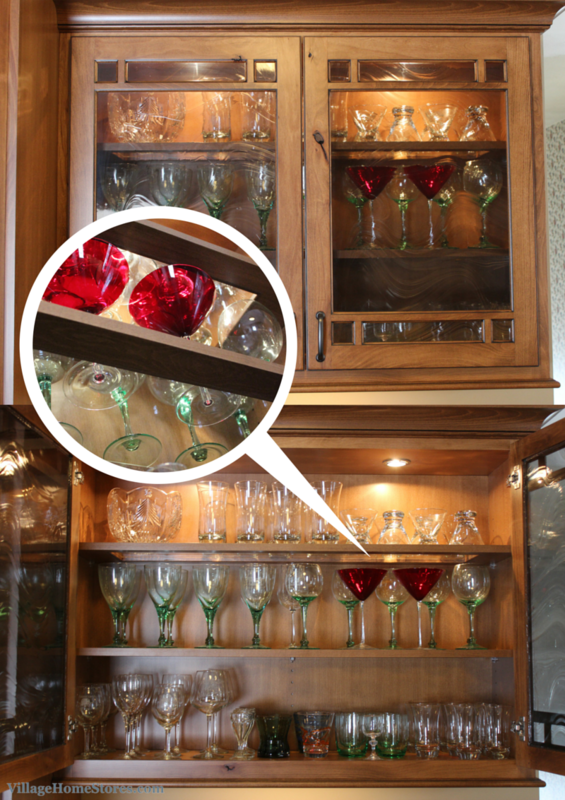 Now the light installed at the top of these cabinets can pass through the glassware AND the shelves completely! Across from the pantry storage zones of the kitchen is the main prep area of of the kitchen. The sink, dishwasher and cooking areas are all found here. Each of the base cabinets on this wall is full of fantastic storage solutions perfect for any kitchen. The corner of the peninsula includes a lazy susan cabinet to access the entire corner space for storage. Note that there is no center pole in this susan design. Instead, a fixed center shelf has a susan resting directly on it. 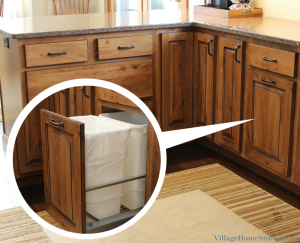 The base cabinet to the right of this susan is a space designed for storing baking sheets and cutting boards. Instead of the expected metal or wood center divider, a slide-out tray is installed. Because the walls of this tray are tall, nothing will tumble out when you pull one from the cabinet. Pull-out trash cabinets have officially moved from the “specialty” cabinet category and have instead become so expected of any new design we rarely sell a space that doesn’t include one. Many times we are even installing more than one. The double-bin option allows you to sort recycling at the time you are cleaning up. At the very end of the peninsula area is wide stack of drawers. The top section has been ordered with two top drawers in place of one wide drawer. Wood silverware dividers have been added to the right top drawer. 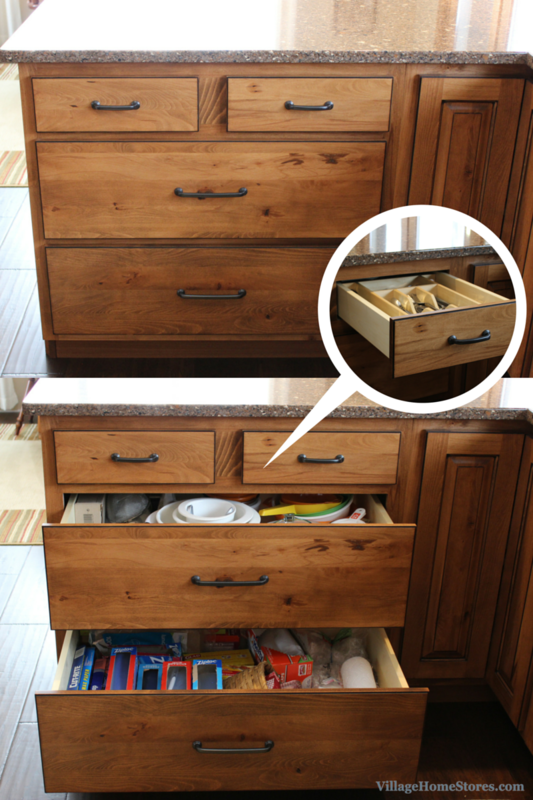 Deep drawers below offer a lot of extra storage. Many items are now available right within reach of this great new prep space. 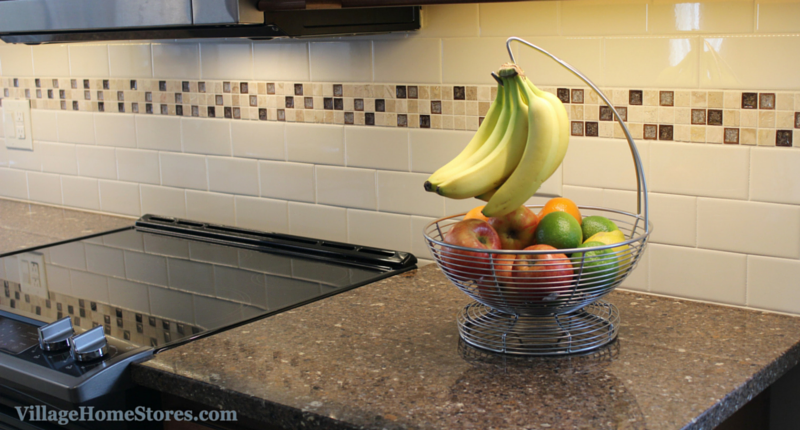 The tile backsplash in this kitchen is a subway tile in an “Almond” color by Daltile. The mosaic insert is called “Rocky Beach” by Glazzio. The field tile is bright and the mosaic is the perfect blend of colors that can be found throughout the new kitchen. Our Diode LED undercabinet lighting helps showcase this tile. The main sink wall of the new kitchen includes a new Whilrpool range and microwave hood. This range is a front-control electric range with convection oven. 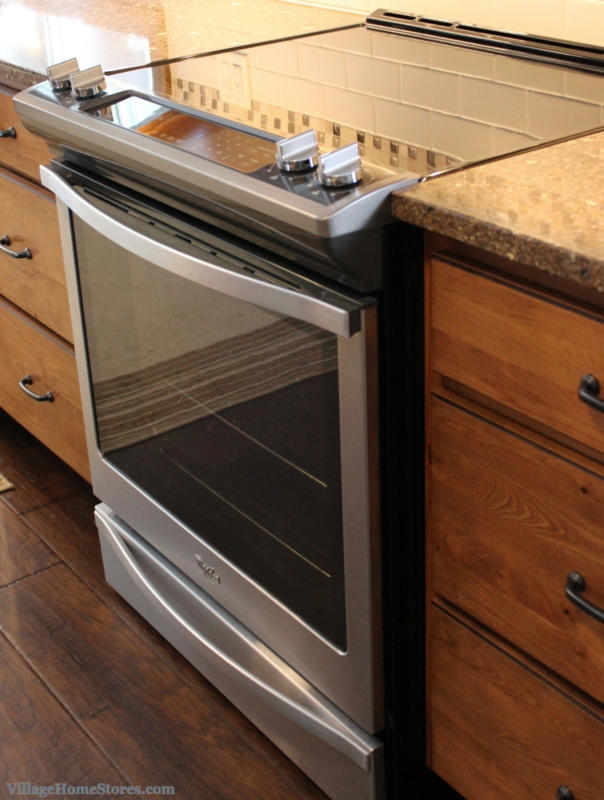 We love how the front-control design allows for a smooth and sleek area where the range meets the backsplash. This Whirlpool unit comes with the new Frozen Bake™ feature. Read more about this timesaving feature on this past blog post. Above this range is a combination microwave hood also from Whirlpool. With 400 CFMs and 2.0 cu. ft. of interior capacity it is a great choice! The surrounding cabinet design is eye-catching from all entrances into the new kitchen. 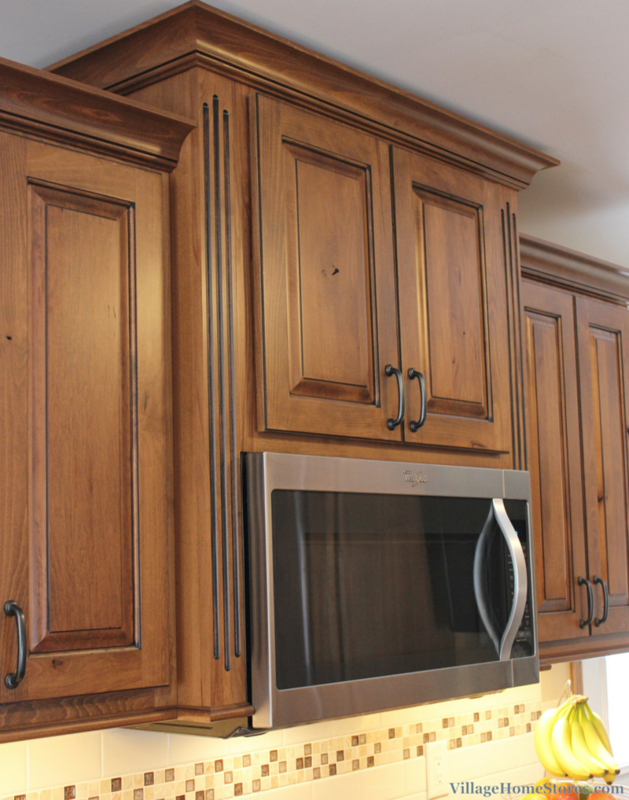 Fluted details on either side of the hood are the perfect place to catch the “Black” accent glaze that has been applied to these cabinets. This accent glaze is also a great way to help allow the design to combine Stainless Steel appliances with Oil-Rubbed Bronze cabinet hardware. 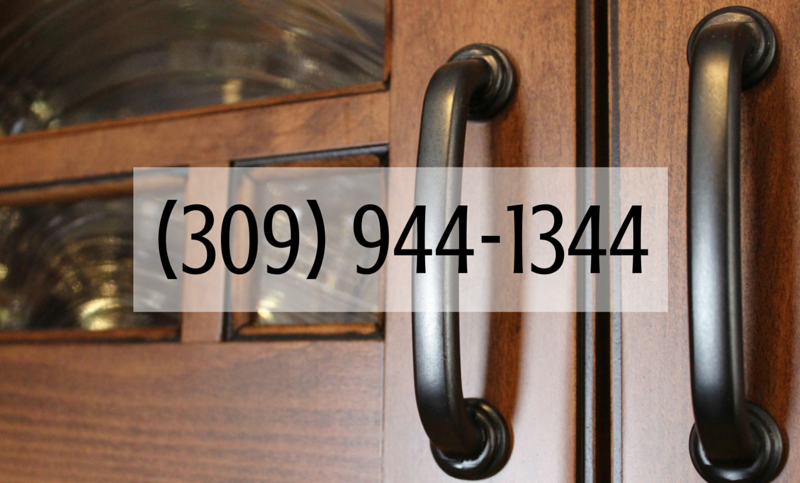 The accent glaze highlights the door details and even the rustic knots found in the wood. The dark finish of the hardware is right at home with this combination. Dark Hickory flooring adds extra drama to the overall look. This Hickory hardwood floor from our Hallmark Flooring line is stunning in person. 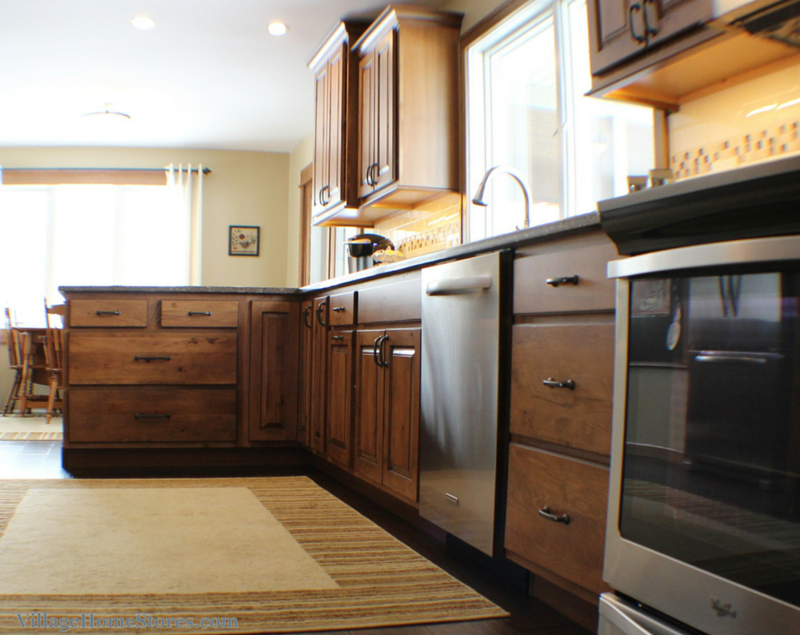 The dark contrast to the cabinets looks rich and the “Sagebrush” finish is perfectly at home with the accented Rustic Beech cabinets. One of our favorite parts of the new kitchen isn’t even a cabinet! We must also point out the handwork by this homeowner in this chalkboard area he created. 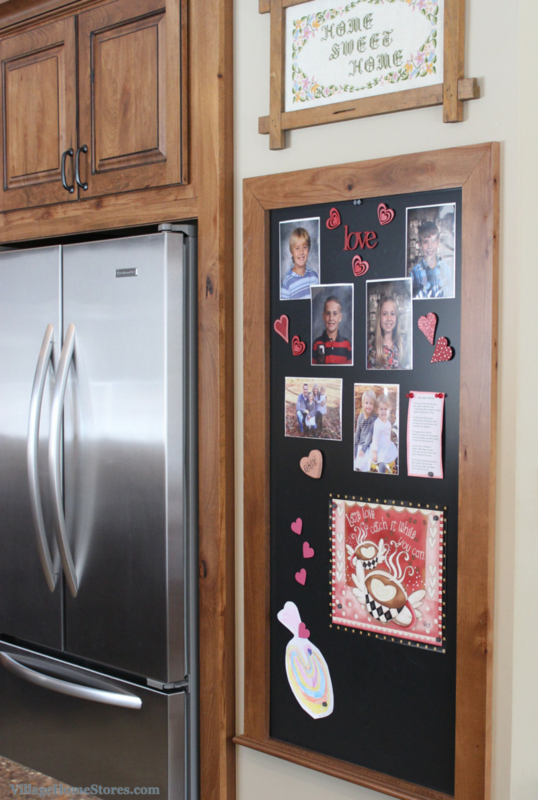 He used just a few pieces of Rustic Beech trim to create a custom magnetic chalkboard area on the refrigerator wall. The lower section of molding even can hold a piece of chalk. What a great way to “extend” the cabinetry finish into a functional piece right between the kitchen and the dining areas. Be sure to check out the full album of photos from this project here on our Houzz page. Are your ready to remodel your own space into a functional and family-friendly kitchen you can make many new memories in? Village Home Stores is excited to hear about what your dream kitchen looks like! Contact us today to make an appointment with one of our expert designers! (309) 944-1344.